So far J El has created 5 blog entries. Feeding over 500 families a year! In 2010 with the economy in a spiral down fall, the need to find willing partners to share in on this experience became more apparent. The Brothers formed an alliance with then State Rep. Perry E. Thurston, Jr., and the Law Firm of Farmer, Jaffe, Weissing, Edwards, Fistos & Lehrman, P.L. and together we fed another 300 families. Determined to do more, in 2013 we increased our families to 500. The Kappa League Youth Picnic and Awards program is where youth are taken to an environment so they can experience nature. The Kappa League Tri-Chapter Awards Program to provide character development and public speaking skills. 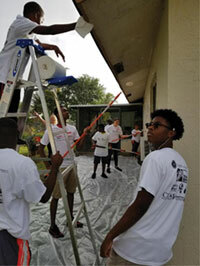 The Kappa League Program provides assistance to young men, especially Black males, of high school age to cultivate and develop their leadership skills with respect to their preparation for collegiate and societal ventures. The Program emphasizes the importance of respect for self, respect for others, and the rewards of community service and the importance of giving back. The Kappa Foundation along with community sponsors holds an annual Let’s Get Moving Fitness Field Day which promotes good health and nutrition. The North Broward Hospital District and Broward County have partnered with the Foundation in this event which is open to the general public.